First time I went fishing was with my father Greg Clogg, he taught me how to fish from a very young age often taken me out catching squid in south Australia. Moved to Brisbane and often going landbased, rockwall’s or to my local jetty at shorncliffe. Last 5 years quite frequently! My partner Nick Spronk also has a love and passion for fishing and got me back into the fishing scene again. I love to fish anyway I can.. lures and bait.. but always catch and release. I have done shore,boat river, sea, jetties, rockwalls and by kayak. 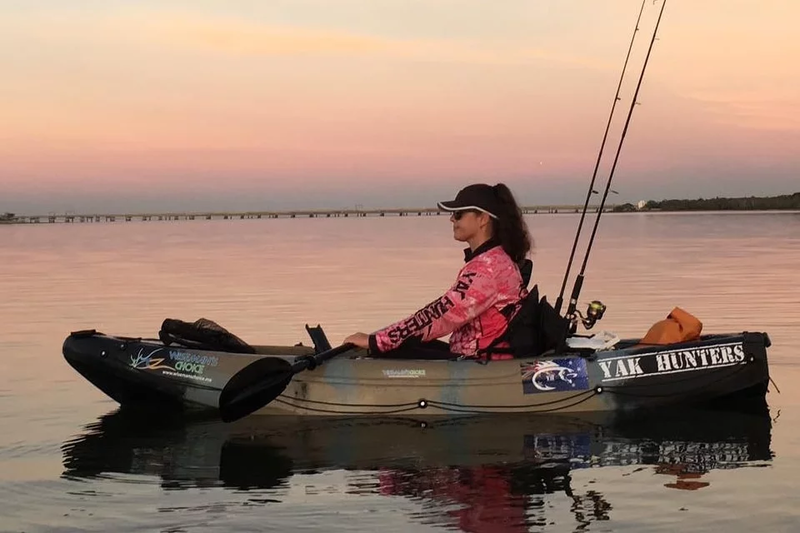 Definitely would be when I am kayak fishing, there is nothing more beautiful peaceful and fun! The scenery and the the fact I can access a lot of places a boat can’t. The rush I get and adrenaline that pumps through me when I catch a fish in the kayak is a feeling like no other, it definitely surpasses the feeling if I was fishing landbased or by boat. And releasing a fish is always the most enjoyable part. Bream are always good fun on light gear but I think freshwater fish like bass and yellow belly as I’ve never had much success as yet and get really excited when I hook land and release them. My greatest fishing adventures would be when I am with my yakhunters group at our competition days or social events. It’s always so good to fish with everyone who has the same passion and love of kayak fishing. I help organise and run the Queensland state yakhunters group. Just be open and share your knowledge with others learn and keep learning.. know the state rules and regulations, bag limits, how to handle and release fish successfully. Help others give advice and just enjoy fishing. quickly take a photo and hurry to release the fish quickly so I tend to forget about measuring them. To keep learning and improving my fishing skills and knowledge and meeting more people in the Fishing community. To help keep running and being part of yakhunters and providing the community with comps, social get togethers etc. I also would like to thank Luke Lispet the managing director and creator of yakhunters Australia for letting me be a part of this group. And my last goal is to go fishing any chance I can get.. kayaking or landbased, explore new places and to purchase more tackle and fishing gear.